It was tough to have to only choose three sessions from all the great ones offered at the DEN 6th Birthday Bash in Philadelphia on June 25. One of the ones I decided to attend was Symbaloo, since I had created an account a while back as part of a DEN special promotion but had never found the time to really experiment with the tool. Daniela Bolzmann and Kimmie Fortelny from team Symbaloo were in from California for ISTE and also to run this session to give an overview of the tool and discuss ways educators are using SymbalooEDU in the classroom. 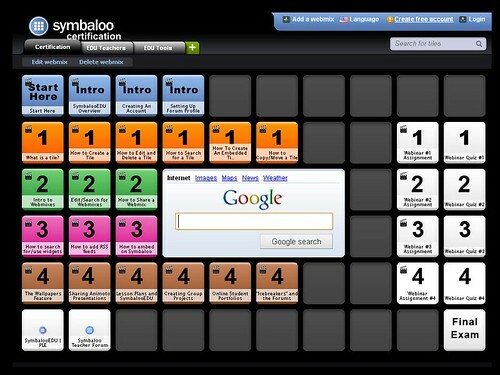 First there was Symbaloo; then there was SymbalooEDU. The EDU version is barely a year old and came about when the team realized that educators were using Symbaloo in their classrooms and finding it to be a valuable tool. According to Daniela’s post of June 24 on the SymbalooEDU blog, it was a video created by one of Randy Hollinger’s seventh grade students called My PLE explaining all the digital tools used in her personal learning environment that got the team to seek feedback from Randy and other educators and start the ball rolling on the EDU version. Randy and his wife Amy are presenting at ISTE on Wednesday, June 29, on the topic of PLEs and project based learning. My wheels are turning for the coming school year just with the idea of setting up a webmix for each grade I teach (third through eighth) with that webmix set as their homepage with all the links we use regularly. Such a timesaver! Badge to put on website/blog/wiki/etc. Even if you are not interested in going for certification, the certification webmix is a perfect set of tutorials for all the things you need to know about using SymbalooEDU, broken into small chunks. Take a look at the certification webmix. On February 20 Kelly Hines shared Lisa Thompson’s webmix of “DEN Goodness” and the resources for the DEN birthday bash are even available on a SymbalooEDU webmix created by Cynthia Brown. Though a basic personal account is free, the teacher pricing plan allows for a teacher account and 50 student accounts. I would have liked to try out that aspect of the site and create student accounts, but my teacher account appears to be broken. Although I received 3 emails from SymbalooEDU regarding my account and how to begin the certification process, when I use that same email to try to log in, it tells me there is no such email. (I was assured it would be looked into). So for now, without any hands on experience myself, I am relying on the information that others have already shared on this tool. One thing that would be awesome that appears can’t be done yet, is to actually embed the webmix itself into an existing page such as a blog or a wiki. Other pages and documents, and even RSS feeds can be embedded into the tiles of a webmix, and you can even embed a webmix into a tile on a webmix, but right now the only way you can share any webmixes you create seems to be by URL. I can see that in a space such as we have in the DEN blog, the webmix would have to be reduced in size to fit, though, and maybe the visual effectiveness would be lost at a reduced size. The screenshot above is a perfect example of how the webmix could be less than useful at a reduced size. Dianne Rees – Serious Games webmix as well as her great step by step for educators creating a PLE with Symbaloo. Do you have a webmix you’d like to share? Please do! Great post, Patti. Need to reactivate my account.